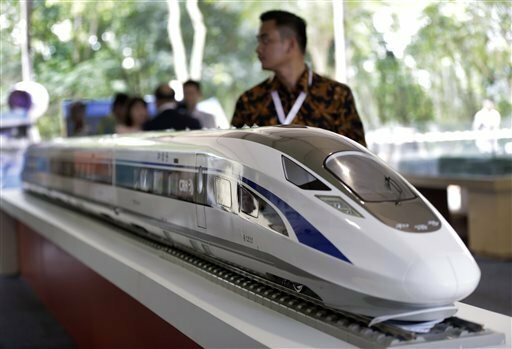 Indonesia has broken ground on a joint project with China to build Southeast Asia’s first high speed rail service, linking the Indonesian capital Jakarta with Bandung in western Java. The 88-mile railway worth $5.5 billion is being constructed by PT Kereta Cepat Indonesia-China, a joint venture between an Indonesian consortium of four state-owned companies and China Railway International Co. Ltd. The groundbreaking ceremony was presided over by Indonesia’s President Joko “Jokowi” Widodo, who signed an inscription on a large stone in Walini, a West Java town and location of one of the railway’s eight stations. The rail deal was signed in October after Indonesia selected China over Japan for the three-year project. China agreed to complete railway without using Indonesian government money or requiring a government guarantee for loans. Indonesian companies have a combined 60 per cent stake in the project. Jokowi said not using the state budget for the rail project in heavily populated Java meant money wasn’t taken away from infrastructure projects in other parts of Indonesia, a sprawling archipelago. He said other railways are under construction in Sumatra and Sulawesi while others are planned for Papua and Kalimantan. Also on hand for the ground breaking was Chinese State Councilor Wang Yong who arrived Wednesday and also will meet with Jokowi. The trains are expected start operating in early 2019 with speeds of 155 miles an hour, and a fare of about $16 for a journey of about 40 minutes. The existing trains to Bandung, the capital of West Java province, take about three hours and cost about $8. The Jakarta-Bandung line is part of a 466-mile high-speed train plant that would cut across four provinces on the main island of Java and end in the country’s second largest city of Surabaya. Several Southeast Asian countries are looking to replace or update aging rail networks, provoking fierce commercial competition between Japan and China which have expertise in developing high speed trains. A line linking Singapore with Kuala Lumpur in Malaysia is expected to be finished in 2020. Jokowi who came to power in late 2014, has ambitious plans to improve Indonesia’s infrastructure, which could boost manufacturing and create hundreds of thousands of new jobs. The Indonesian state-owned companies in the joint venture with China are construction company PT Wijaya Karya, railway operator PT Kereta Api Indonesia, toll-road builder PT Jasa Marga and plantation company PT Perkebunan Nusantara VIII.